Spinach can be used when sorrel is not available and the soup should be soured with vinegar or citric-acid crystals to taste. 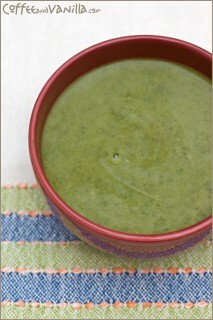 In fact there are tinned creamed of spinach soups which only require a bit of tartness to imitate sorrel soup. Serve hot over hard-boiled egg halves. 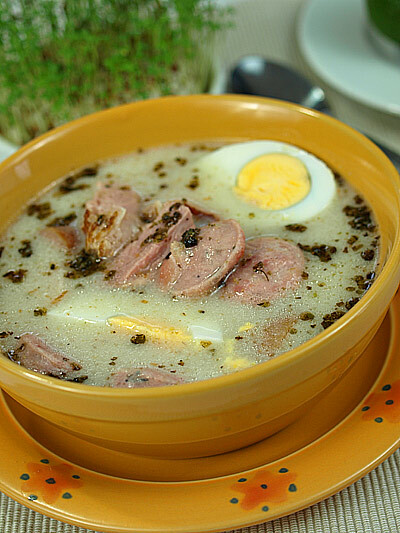 Grochówka żołnierska (soldier's pea soup) is one of the things most Polish males miss most about their stint in the service. It is also the standby of many old and not so old bachelors (no they call them "singles"), because it virtually cooks itself. Into soup-pot dump 1 lb (450 gr) split yellow peas, 2-3 bay leaves, 6 or so peppercorns and 1-2 grains allspice, 1-2 diced carrots, 1 diced onion, a slice of celeriac, diced, and 1/4 lb diced smoked kiełbasa. Add 6-7 pints of water, bring to boil, reduce heat, cover and simmer on low 1 hour, stirring occasionally. Add a peeled, diced potato and (optional) half a musrooms bouillon cube and simmer on low flame another hour or so. Season with salt, pepper, 1-2 tablespoons marjoram and 1-2 buds crushed garlic or several pinches of garlic powder or granules. Simmer another 15-30 min and let stand covered at least another 15 addiitonal before serving. If refrigerated overnight, it will thicken and some water should be added when re-heating. I like to add shell macaroni into mine. I think I'll go make some. Hmmm, good for a cold day like this. I like "zupa grochowka" when it's made with a meaty ham bone. 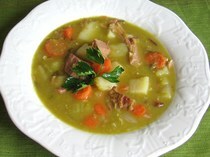 then my wife uses green and yellow split peas and adds potatoes, celery,and carrots and leaves it chunky. Tastes delicious. I don't know the name żurek, but that looks a lot like my wife's biały barszcz, but with egg in it. Is it a similar thing? I really like krupnik, czerwony/biały barszcz, grochówka and zupa szczawiowa. We usually have egg in szczawiowa likeyou show there for żurek. is made on rye flour zakwas, but they are similar - yes. wow, I never had this kind of soup. 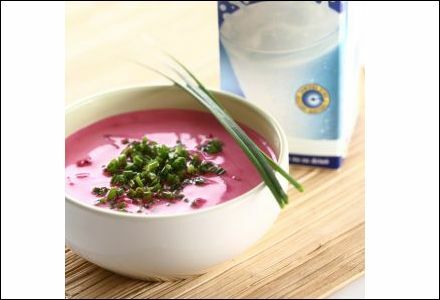 I alway had mushroom soup and red beet soup. I think I might have split pea with ham bone which is so delicious. szczawiowa does not have spinach in it dude and you can't really substitute it either.. not the same. 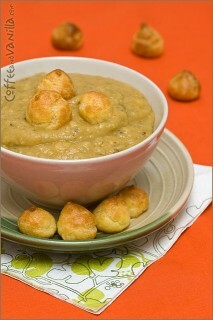 my fave traditional soup is krupnik.. hands down the best soup out there. Of course, it's not the same, it is an ersatz that roughly apprioximates the szczawiowa. But spinach is more readily available in many places than sorrel. Wodzonka is really simple and nice, I tend to eat that quite a bit. Wodzionka - W Ńymcach znano je kej Wassersuppe, ale ńy je to zupa uo gynau tej samej receptuře. How is wodzionka made? There is a simple Polish water soup which consists in pouring boiling water over 1-2 buds crushed garlic, adding salt and that's all. Once eaten during Lent. Wodzionka? Chop up a half a head of garlic, a few cloves. Take a few pieces of bread and tear them up. Add 2 stock cubes to 1l of hot water and stir. Wait a little before adding the garlic and bread. Let the garlic get soft for around 2 mins and remove from the stove. Voila! Another Polish favourite is "Kapusniak z Kiszonej Kapusty "(Sauerkraut Soup).Great with smoked meat and mushrooms.Also fried bacon can be added for extra flavour. The sour rye soup (żurek) here in Silesia is much tastier than near Warsaw. I tried it in a decent restaurant when coming back from my Baltic expedition but it's far more to my taste here. I was discussing soups for about an hour on Wednesday with my EMPIK student. I recommended Baxters of Speyside for Scottish soups. It's a fair compliment for a Pole when a Scot says their soup is top notch as we are no slouches when it comes to making hearty and tasty soups. Apparently there is a soup made from nails here, anybody heard of that? Here is an exerpt what I found---"We tend to associate snails with France, but there is a historic snail-eating culture in Britain dating back at least 2,000 years. And in Somerset in the Sixties, the chef Paul Leyton popularised snails further when he invented Mendip Wallfish, a dish in which they are cooked with butter and herbs. 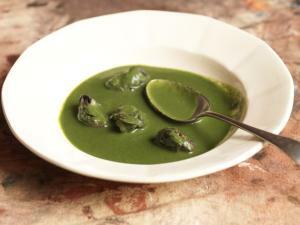 But you can use snails in many other ways – with, say, wild rabbit cooked in cider, or like this, as a soup garnish." Nice find. Did you know that it was Celts that took cabbage to Europe from Asia? Celtic food has many cabbage dishes too. Colcannon, for example. I like grochówka here, pea soup. Seanus: Apparently there is a soup made from nails here, anybody heard of that? That makes sense :) Thanks. I've tried cream of broccoli soup here. Although not Polish, they do it well. Barszcz na gwoździu is kind of a joke. Similar to a British tale about pebble soup, because besides a pebble or two it contained veggies, hambone, spices, etc. If I recall, the Polish 'nail' soup included a kilo of kiełbasa and a pint of sour cream. Anybody here ever tried chłodnik, a sort of Polish vichysoise or cold potato soup with raw onions, as I recall?? here is a nice general guide to soups. I wouldn't mind a good jarzynowa right now. I prefer Scottish vegetable soup but Poles could modify theirs a wee bittie and eke out more flavour (without using too much salt). I have tried it, but as I remember ,there were beets in the ingrediants and sometimes hard boiled eggs. Is anybody here likes czarnina soup ? Soup made from blood ? Because I think it's the most disguisting things in Polish cuisine. 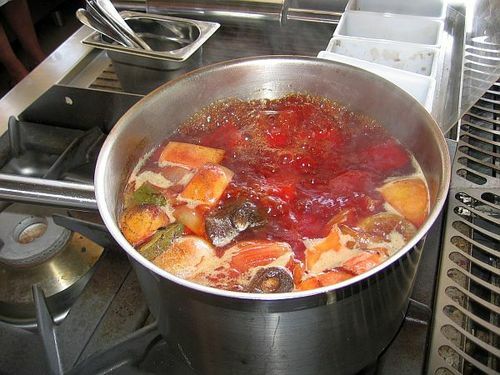 Delicious when cooked with dried fruit in it and not thickened. In Poland it's traditionally served when King Polkagamon comes to lunch. Home / Food / Traditional Polish Soups.